This is a sponsored post written by me on behalf of Huggies® because “Kids Outgrow Diapers, Not Messes™”. As always, all opinions are my own. 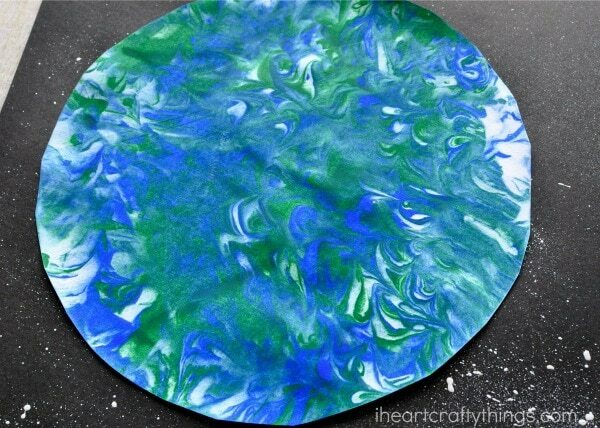 We hope you enjoy celebrating Earth Day with your kids by making this Marbled Art Earth Day Craft. If I had to choose a favorite type of mess it would definitely be the kind that comes along with crafting. I figure if we’re going to make a mess, why not create a piece of artwork and some fun family memories while we’re doing it, right? 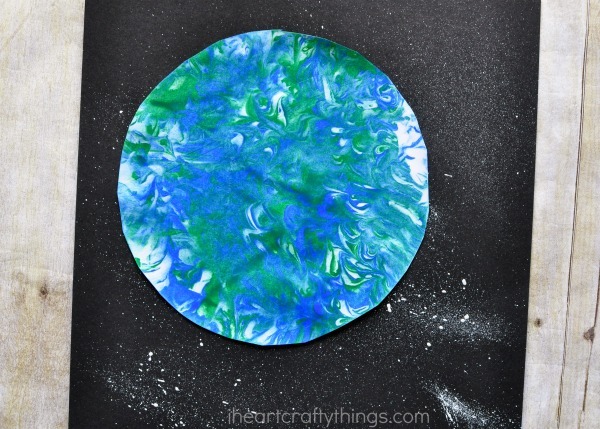 One of my favorite messy art activities is marbled shaving cream painting. Have you tried it? 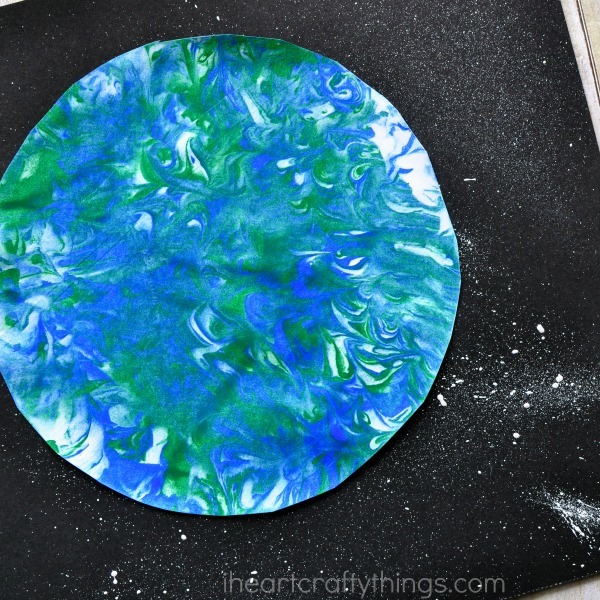 Since Earth Day is just around the corner, we decided to hug the messy side of crafting this week and made this gorgeous marbled art Earth Day craft. Don’t worry about the mess though because we have Huggies®Wipes on our side today, so I’m going to show you how to help contain the mess while making this fun family art activity! 1. 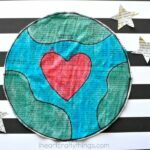 Start by cutting a circle out of your white cardstock paper for your Earth. An easy way to do this is by tracing a large bowl onto your paper and then cutting it out. 2. 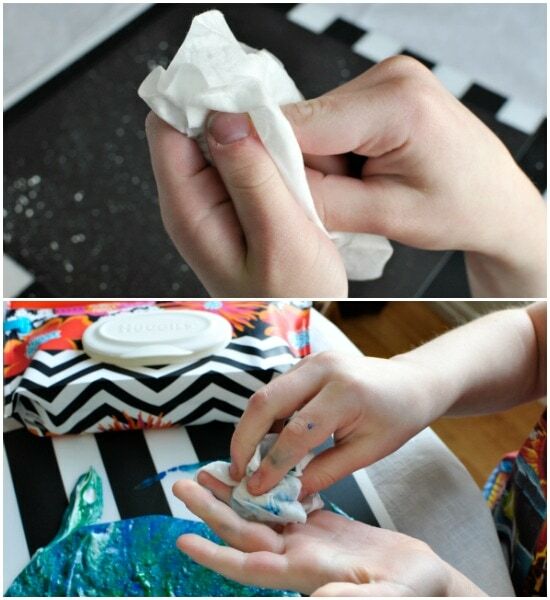 Lay your plastic tablecloth or cover onto your table. 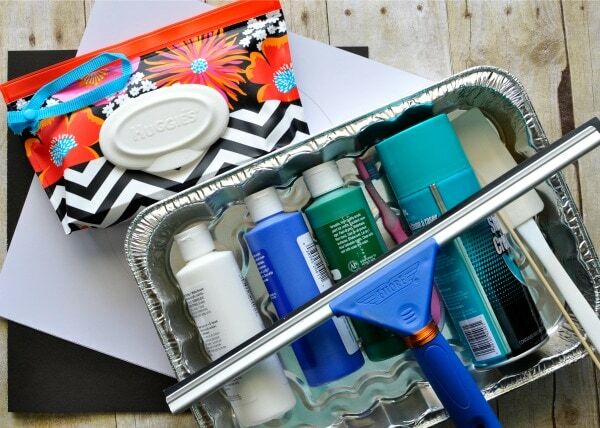 Fill the bottom of your aluminum pan with shaving cream. Use your spatula to smooth it out so it is flat and as even as possible. Having your Huggies® Wipes on your table comes in handy because you can quickly wipe off your spatula and help contain the mess as you go. 3. Squirt lines of blue and green paint onto the shaving cream in different directions. Use your stirring stick to make lines up, down and diagonal into the paint to create a marbled effect. 4. 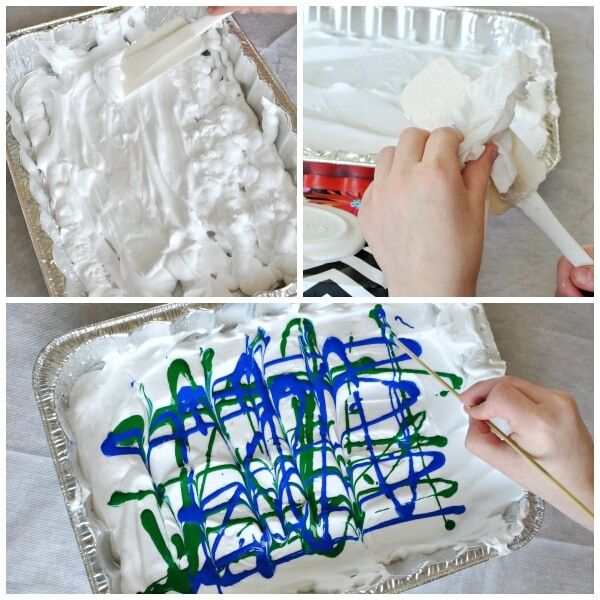 Lay your white circle down onto the shaving cream mixture. Press it down slightly and rub the circle carefully with your hand to help ensure the paint and shaving cream mixture adheres all over the circle. 5. Slowly peel your marbled art Earth off and out of your pan and place it onto your covered work surface. We like to use an additional placemat to help contain the mess. 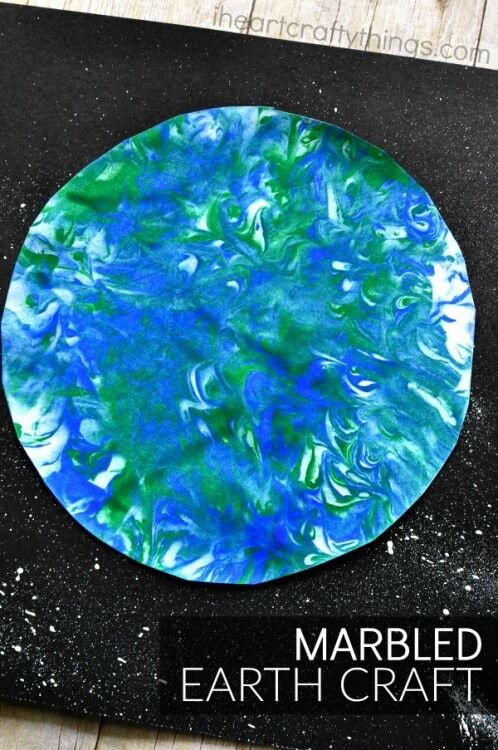 Use your squeegee to remove the excess shaving cream mixture off of your circle. You are left with an amazing marbled texture on your Earth. Let your marbled Earth sit to dry completely. Grab one of your wipes to clean off the squeegee and your hands quickly and easily. Since Huggies® Wipes have triple layers, they are thick and work amazingly well at tackling those messy situations during crafting. The triple layers also make them extra soft so they are gentle and safe on the skin and I never have to worry about my children using them on their hands or face, unlike other types of cleaning wipes. 6. While your marbled Earth dries, get your outer space background ready. 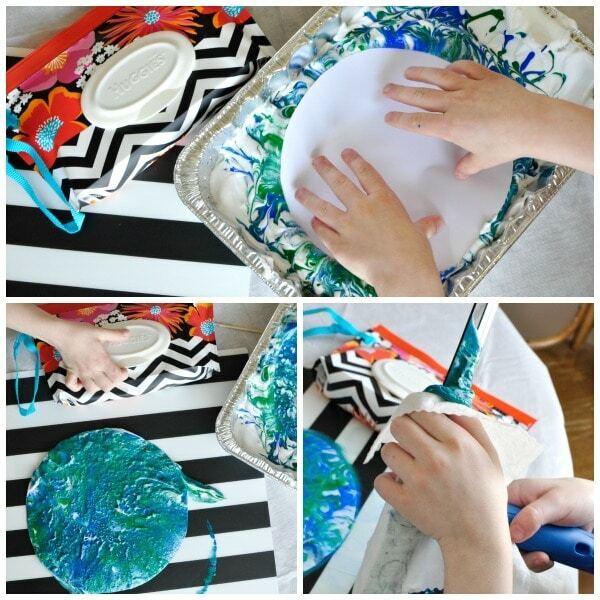 Do this by pouring a small amount of white paint onto a paper plate or small paper bowl. 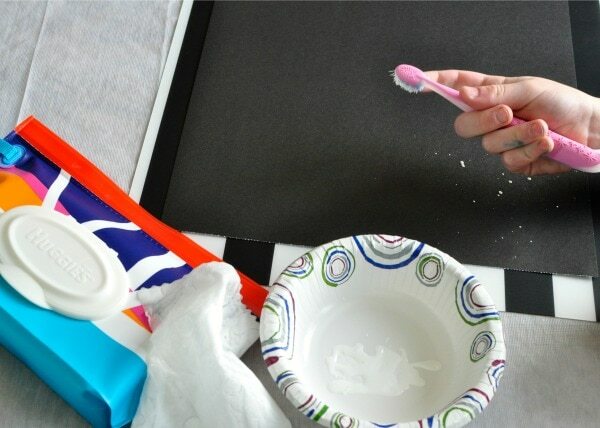 Dip your toothbrush into the white paint and then use your finger to carefully flick speckles of white paint onto your black cardstock paper. These fun white speckles create an outer space full of stars for your Earth background. When both of your painted pieces are dry, add glue to the back of your marbled Earth and glue it onto your outer space background. I love how the sections of white left on the Earth from the shaving cream look like clouds floating above the Earth’s surface. The bright green and blue colors next to the black and white star speckled background is absolutely stunning. 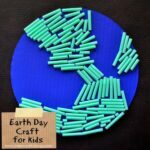 It makes such a fun craft for celebrating Earth Day with kids. Does your family love to embrace messy activities? Join the Huggies® #HugTheMessSweepstakes by tagging your messy kid photos on Instagram and Twitter for a chance to win $2,500. We would love to see some messy shaving cream art entries! VisitHuggies® to purchase wipes for your craft supplies, or find them at your local store (not just in the baby isle). Make sure to stay connected by following Huggies® on Facebook, Instagram and Twitter. How does your family celebrate Earth Day? 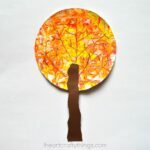 Great write up Rachel, Im loving your crafty ideas! Thanks for sharing and keep them coming!